LD is very interested in video games. Not just playing them, but also learning about them, reading, researching, and anticipating new releases. 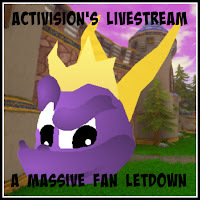 Activision announced a livestream, promising to reveal details of a new release, which he was hoping against hope would be Spyro, because he had been waiting for news for a very long time. It mattered to him, and he was so excited about the release finally being confirmed, that I thought it would be fun to see the announcement live, so I let him watch the livestream, which went on til 2am UK time. 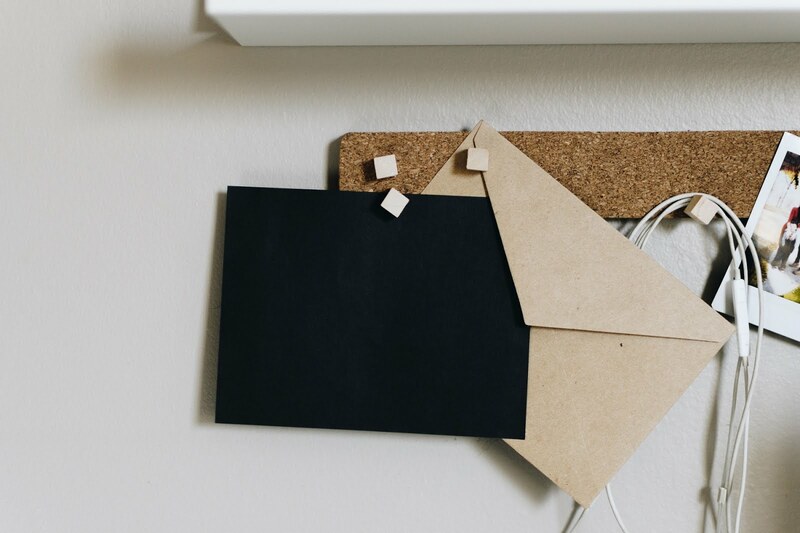 Despite many promises, though, they actually announced nothing, leading to anger and disappointment for those who had put themselves out and had their time wasted. 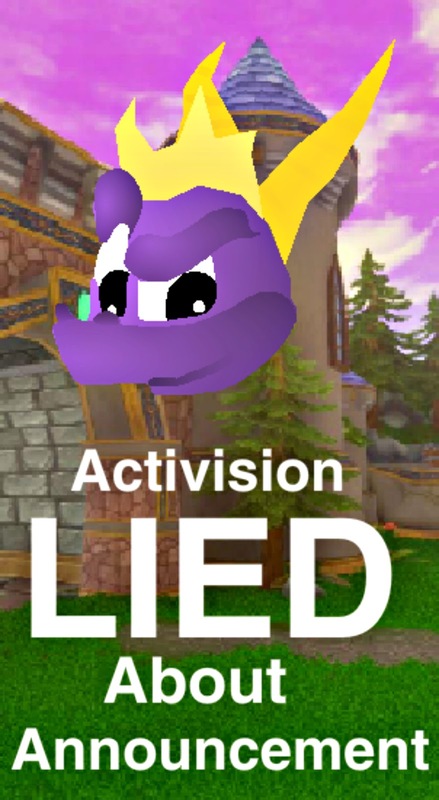 Activision have been dropping hints about a new Spyro game for a long time and I can only assume all the rumours and bits of not-quite-information they've been leaving lying around for ever are part of some kind of marketing strategy. They also have a habit of messing people about in the name of humour, but it needs to stop, since their target market are children and their parents, who buy their games, I don't think it's fair to wind everyone up with tidbits and promises, just to get more people to watch the livestream, then let them all down. 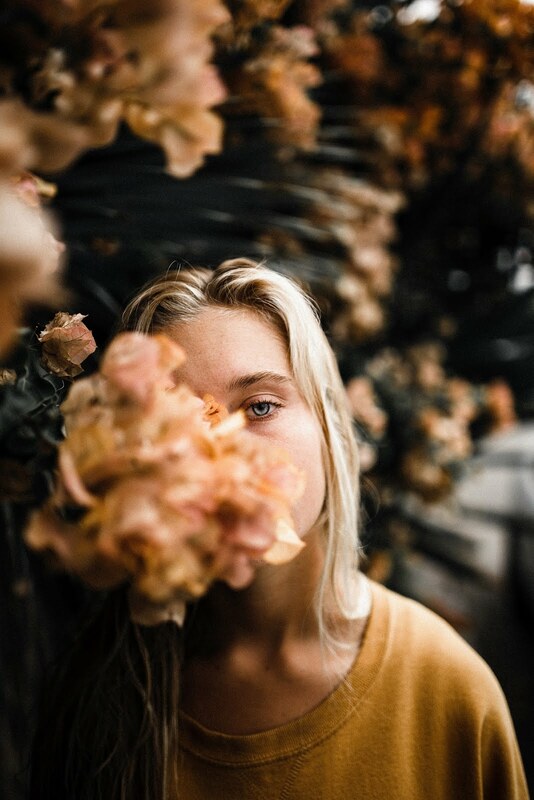 If you've got nothing to say, fine, but don't make promises you can't deliver. It has made us both feel very negative about the whole thing. We all stayed up for the livestream, because it's the holidays and I thought it would be fun, but it was a massive waste of time and a huge let down for everyone watching. This is LD's account of what happened and I promised I would publish his rant, because he wants everyone to know how cross he is with them and I think he has a right to be heard. He is a consumer, after all. I STAYED UP UNTIL 2AM TO WATCH AN ANNOUNCEMENT FOR MY FAVOURITE GAME, AND THEY LIED. Spyro The Dragon rant by LD. I'm one of those weird kids who loves to play retro games, like Sonic or Crash Bandicoot, because I grew up playing with retro consoles (I don't think my parents could afford a PS3, EXPOSED!!!) I'm so sorry for Nintendo fans, but I was a PlayStation kid. I loved playing Lego Racers, Rollercoaster World, and my beloved character - who happens to be the character I'm talking about today - Spyro The Dragon. I love this game, for having such an engaging story, challenging (but somewhat completable) levels, and rewarding gameplay. Spyro is an icon of PlayStation, and gaming history. Being a lifelong twin with Crash Bandicoot, being that they share demos in the original games, nothing could possibly go wrong! Whoops, I made a mistake there. The only good games were the original three, and all the others were just lazy. From Lord Of The Rings, to the Sonic 06 of Spyro, there were some huge changes, but that's for another blog post, sorry! The only change I will discuss, is one change that KILLED Spyro. The one that can never be reversed. The one that any parent will most likely know (depending on whether you bought/ paid any attention to this game for your kids). The one that just blatantly ASKS for money: S k y l a n d e r s.
...oh I'm not talking about your kids, I'm talking about ACTIVISION. If you don't know already, Activision created Skylanders. Activision also have a reputation for ruining franchises (*cough*cough* Spyro), squeezing money out of cheap games that are rushed for yearly releases, and just being downright stupid. If you haven't put 2 and 2 together yet, Spyro is in Skylanders, but as a matter of fact, he existed DECADES before Skylanders. Skylanders ruined him by turning him from his own character with his own game, to a marketing ploy for Skylanders: Spyro's Adventure. The games aren't even about him! The games are just lazy, but Activision, somehow, have done worse. 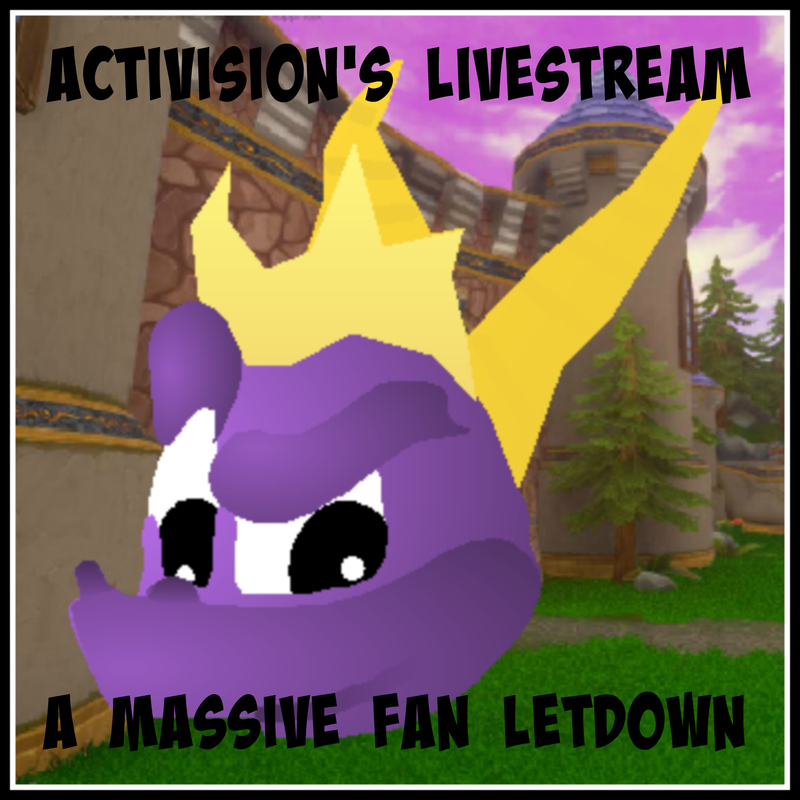 Activision said they would make an announcement on a livestream of Crash Bandicoot. I was freaking out, because with all the evidence of a Spyro remaster, I knew it was coming. Could this be it? COULD THIS BE THE ANNOUNCEMENT? KEEPING IN MIND THAT, BECAUSE ACTIVISION ARE AMERICAN, I HAD TO STAY UP UNTIL 2:00 am JUST TO WATCH THE LIVESTREAM. Ok, so the livestream started, but as SOON AS THEY STARTED THEY SAID THAT THEY WOULDN'T ANNOUNCE ANYTHING. SO I STAYED UP TO WATCH A HUGE LIAR NOT EVEN PLAY THE GAME, BUT TALK ABOUT JOB-LISTINGS. THIS HAS GONE TOO FAR! PLEASE ACTIVISION, JUST TAKE MY FLIPPING MONEY!!! Ok. I kept watching, because they had allotted one and a half hours for this game, and they were only playing 15 minutes of each Crash Bandicoot game. What would they do for the other 45 minutes? Well I'll tell you! They talked about what's inside donuts and job-listings. Oh, and his life story. I STAYED UP AT MIDNIGHT TO WATCH A STREAM THAT WAS SO IMPORTANT TO ME, THAT TURNED OUT TO BE A LIE!!! If I could ask ANYTHING of you, the parents, don't buy ANYTHING from Activision EVER again. They ruined a child's dream (of getting some sleep). This has crossed the line. Look. I want to say this loud and clear. Never say never. Don't lose hope. It is coming. I know it is. We don't need convincing, just confirmation. How much evidence have we gotten so far? Tons. I can't say much to help you, except that this was an April fool's day joke, just made early. He did have to delay the livestream, because his schedule was full. He might have a full schedule on April 1st. Oh, and I'll tell you this: ITS NOT CALLED THE ENCHANTED TRILOGY! That image has been around ever since a Spyro remaster was considered possible. It's fake. Also, it says 'Enchanced trilogy' not 'Enchanted trilogy'. I thought it would be obvious! Whoever this supposed retailer is, they put it up for a replacement of the real box art, because they don't have it yet. Ahh how sad, I really feel for LD.